It had snowed a couple of days before we left for Utah. 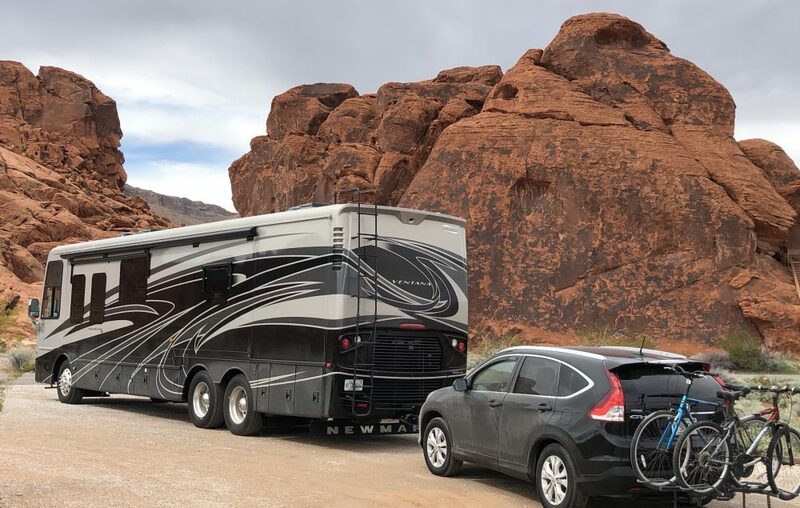 We were already on I-15 in North Las Vegas, so it was only a 2 hour drive to St. George Utah. I-15 North took us through 12 miles of NW AZ, some of the most dramatic and beautiful scenery we’ve seen so far. These 12 miles of I-15 between NV and UT are actually in AZ and the road was built through the mountains in 1965. It was an expensive project and with the help of the UT government it took 2 years to build. The road gave better access to Las Vegas for Utahans and an easier road for trucks to maneuver. The road winds through the Virgin River Canyon from Mesquite to St George and we would have missed it altogether had we not decided on this jaunt. The city of St. George is not far from the border and new construction is going on everywhere. It’s a very nice city, many restaurants and the Temple is prominently placed in the center. One thing we noticed were the wide streets, even side roads were the width of 4 lanes, which was fortunate as once again we zigged instead of zagged and ended up on E123rd ST, very residential, but the road was as wide as an interstate. Finally in a place with no homeless, graffiti or garbage, which we saw so much of in California.